Editor: This completes our five-part conversation with former practitioner Tanner Johnsrud, who is now a baptized Christian. Continuing from the fourth part, Tanner spells out more of the reasons he sees the Christian Science movement in steep decline, rather than progressing toward global preeminence as Mrs. Eddy predicted in 1902. Previous posts in this series are here, and here, and here, and here. The young convert’s analysis concludes below. Tanner Johnsrud writes: As I said previously, there are a number of different challenges facing the Christian Science movement, if it is indeed to fulfill Mrs. Eddy’s prophecy that CS will become the only religion on the planet (My. 267). Indeed, there are many challenges they will need to overcome if they intend to all but disappear within my lifetime. In Genesis 1, God gave the command to men and women to be fruitful and to multiply. God made His people to bear His image. And as image bearers we are instructed to have children, bringing forth more of his image bearers upon the earth. In fact we are to fill the earth with His image-bearing children. Echoing the command in Genesis 1 to fill the earth with God’s people, who are made to glorify God and enjoy Him forever, Jesus commissioned his disciples to “go therefore and make disciples of all nations, baptizing them in the name of the Father and of the Son and of the Holy Spirit” (Matthew 28:19). The Christian church, ever since, has increased its numbers through having children and through preaching the gospel all around the world, which then brings new people to Christ, as the Holy Spirit wills. This fills the earth with people glorifying God! But the Christian Science church hasn’t followed this approach. I certainly have known a few Christian Scientists who were quite zealous in sharing Science and Health or Christian Science periodicals with the public. But they were always the exception that confirmed the rule, and frequently made the average Christian Scientist a little uncomfortable. Christian Scientists often tend to sit in their Reading Rooms waiting for the public to be receptive enough to seek out Christian Science, and come banging down their doors clamoring for a copy of Science and Health. The implicit message Christian Scientists unwittingly convey is that “CS has all the right answers, and when you are ready to receive it, you will come to us.” Christian Scientists do have magazines to share with people that they think might be interested. But there is no evangelistic fervency – because there is no gospel. To them there is no judgment after death, no hell, no heaven, or new creation, in a Biblical sense. According to the CS narrative, everyone will eventually come to the truth of Christian Science whether in this lifetime or the next. In the CS worldview, there are no eternal consequences for accepting or denying Jesus or Christian Science. As such, there is no real particular zeal on the part of Christian Scientists to spread CS. Everyone will figure it out eventually, when they are ready to receive the truth of CS. When I was in Boston many years ago, I heard from some intimately familiar with the membership statistics that if Christian Scientists signed membership applications for new members once every 23 years, there would be no decline in church membership. That is not a very high bar. And yet, membership in The Mother Church has been in decline for many decades. That means that Christian Scientists are not signing the applications for new members. They are not bringing other people into Christian Science. Anecdotally, I do have a few friends who became Christian Scientists and were not born into it. Most of them came into Christian Science through marriage, though several did not. Still the number of people I know who have come into Christian Science on their own is very small. If Christian Science is going to become the only system of healing and religion on the planet, then Christian Scientists have to work a lot harder and do a lot more. They need to be out in their communities telling people that everything they have known about God, reality, matter, life, sickness, sin, death, emotions, love, and so on is wrong. And, they would certainly say, they need to prove it by healing. The fact is, this would require a massive cultural revolution within the CS community. And despite attempts through the years to encourage the church members to be more active in sharing Christian Science, the members have always reverted back to the assumption that non-Scientists will come to them when we are ready to receive CS. When my wife and I left CS in 2017, very few people tried to stop us, and even fewer tried to bring us back into CS. As I heard from a few people, they believe that we have just temporarily succumbed to “malicious animal magnetism,” and that we will return to CS when we have come to our senses. In the meantime there is no reason to discuss CS with us, or try to bring us back–because they’re sure we will just come back eventually. As I said before, the Christian church has grown through conversions and through having children. Christian Scientists certainly aren’t making many converts. What about having children? One of our unexpected cultural surprises about becoming evangelical Christians is the very different approach to families and family size. In the Christian Science community, most families with children had two or possibly three children. Occasionally you see CS families with as many as four children. But that is unusual. However, in our new church having three or four children is completely normal. I have met several families with 6 or 8 children. The fact is, Christian Science cannot overtake evangelical Christianity and become the only religion on the planet if Christian Scientists are not converting evangelicals and are not having more babies than evangelicals (or Muslims, Hindus, Buddhists, etc). I have several CS friends and people I deeply respected who never consummated their marriages, even after several decades. In a previous era one very prominent and respected Christian Science teacher had to leave his home city for a different city because the local Christian Scientists were so scandalized that he had a child in wedlock. Really, most Christian Scientists today don’t follow the extreme versions of these teachings. But quite a number of ardent young Christian Scientists I know do not have any children, frequently out of a desire to be loyal to Mrs. Eddy’s teachings, and not to have things which distract from their Christian Science practice. If so many Scientists are neither having children nor converting people to CS, then how can the movement ever fulfill Mrs. Eddy’s prophecy that it will be the only religion on the planet? We all know that there is a massive revolution going on in our society on the subject of sexuality and the family. This is causing massive questions for mosques, synagogues, and churches all around the Western world. The Christian Science movement is no exception. In recent years there have been articles in the official Christian Science periodicals that have been affirming of homosexuality and transgenderism. Principia has changed its policies on LGBT issues so as to be affirming of LGBT students and faculty. In fact I recently visited Principia College and saw that it was celebrating LGBT+ Pride Month (whether officially or unofficially I don’t know, but there are signs promoting it in the Concourse). These trends appear likely to continue. I care deeply about CS friends on both sides of the LGBT question. And both groups have some tough questions to answer when it comes to CS in the coming years. If my pro-LGBT CS friends believe that Mrs. Eddy is incorrect in her statements about marriage,then couldn’t she be incorrect elsewhere? Ultimately this opens the door to their picking and choosing quotes from the Mrs. Eddy’s writings that they wish to follow, much like Scientists do for the Bible. This is a recipe for ultimately leaving CS as taught by Mary Baker Eddy. On the other hand, my CS friends who do not support the LGBT cause have a tougher series of questions to ask themselves. Why do they oppose homosexuality? Why don’t they support transgenderism? In the CS worldview God created ideas, not material bodies. If the body isn’t real, then why should one’s identity be described by their physical body and DNA? Many CSists I have talked to who oppose homosexuality and transgenderism say they do so because it runs contrary to the Bible. And yet these same Christian Scientists also reject Biblical teachings on other matters, such as the sinfulness of man, God’s judgment, or the deity of Jesus. Do they have a consistent basis for reading the scriptures that allows them to oppose homosexuality and at the same time reject other Biblical teachings they don’t like? Given the move in various CS institutions towards embracing LGBT issues, how do my friends in CS who oppose homosexuality think that this will play out in the movement? A number of families withdrew from Principia when the LGBT policy changed, but they still maintain their membership in The Mother Church, which has further embraced LGBT issues. Do these dissenters think that they will change the hearts and minds of the larger CS movement? Or do they think that they will constitute a faithful few that will remain loyal to “pure” CS to the end, while the church collapses around them because it has embraced sexual immorality? Is that their Father-Mother’s plan for the church? These questions, and more, are all questions that the CS church will increasingly have to face. If Christian Science is going to become the world’s only religious system, and thus the CS church the only church, it is going to have to unify on these and other important questions. Christian Science grew out of a distinctly progressive social milieu. Many of Mrs. Eddy’s early followers came from decidedly progressive backgrounds. In fact, she was on the way to a temperance meeting when she took her famous fall on the ice in 1866 — the temperance movement and prohibition then being very much a progressive social cause. She had a number of conversations with the transcendentalists and spiritualists of New England. There were in the circle of her early workers, a number of socialists, agnostics, and those who practiced forms of what might today be called New Age spirituality. A number of Mrs. Eddy’s followers believed her teachings to be the essence of spiritual progress, as well as a humanly progressive belief system and way of life. One core issue of progressivism is the mythic narrative of progress. The Christian Science view of the history of the Bible is not one of creation, fall, redemption, and ultimate consummation in the new heaven and new earth. It isn’t the story of God making and keeping a covenant with His people. Rather, in the Christian Science version, the Bible is the story of a progressively clearer understanding of God. This starts, according to the CS worldview, with crude and rudimentary ideas of God in the Old Testament, which get clearer and clearer, and then become more clear in the teachings of Jesus. And then after what Mrs. Eddy refers to as 1800 years of progress, she herself claimed to have given the final revelation. 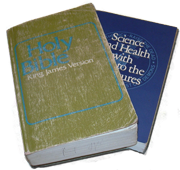 I would certainly agree that the Christian Science god is not the Jehovah of the Bible – who the New Testament writers say is Jesus. A brave and interested Christian Scientist might want to look at Romans 10:9, 13 and compare it with Joel 2:32. Or they might want to look at Isaiah 45:21-23 and see how that is quoted in Philippians 2:8-11. There are many more references than can be cited here, but it is overwhelmingly clear that the New Testament writers understood that Jesus is the Yahweh, the Jehovah, of the Old Testament. Christian Scientists expect that progress is going to happen in all of their healings. And there is a view that the world must be getting better all around us. This narrative doesn’t fit with what we see in the world around us. And so how do people respond when the world doesn’t line up with the narrative of progress? Well, one way is to just ignore anything that doesn’t fit within the narrative of progress. And I know plenty of CSists who follow that approach. Another approach is to modify the narrative of progress — progress is inevitable, but only if we are working hard enough. This breeds so much guilt. Certainly so many CSists go through life with so much guilt because they haven’t had a healing. Because, they think, certainly they have done something wrong or don’t know enough, in order to have a healing. Christian Scientists certainly look around at their churches, and they see that the numbers are in decline. They think that the churches aren’t growing because they have figured out the right signage for the Reading Room, or the right graphics for the periodicals, or the right whatever which will be necessary to cause CS to grow again. The guilt and never-ending treadmill of works-righteousness continues unabated. Guilt and the fear of animal magnetism certainly drive so many Christian Scientists today. Many followers of Mrs. Eddy think that the reason that Christian Science isn’t being embraced by billions of people today is because of a failure to “handle animal magnetism.” This just sends them back to Mrs. Eddy’s writings, or the work of their favorite teachers, in order to find what they need in order to handle the animal magnetism ostensibly keeping CS from fulfilling its destiny. Given the narrative of the inevitability of progress, one way to modify that narrative is to claim that there IS progress going on, but it is among an elite few. I know of many Christian Scientists who believe that The Mother Church has gone off track in one way or another. Ironically, these groups of people think it has gone off track often for mutually contradictory reasons — too much focus on MBE vs. not enough focus on her, too much compromise on medical, moral, and other issues vs. not enough keeping up with the times, etc. But many of these groups of people believe that they have the “real” truth of CS, and that they will constitute a real remnant of true CS when their opposing camps have gone away. These groups then form their own elite circles. I had many hush-hush conversations with CSists all across the spectrum who were all looking to change things, and believed they or those like them had the key to fixing the CS movement. They were always more than happy to bring you into their circle. And they would make claims that they were developing ever purer (or contrariwise, ever more accepting) views of CS. Progress WAS going on, but only in their sub-group. Some of these different sub-groups within CS culture can operate in very cultish ways. Secrecy, devotion to the leaders of these movements within a movement, manipulation, information control, us vs. them mentality, and more are all on display in these sub-groups. Whether anyone in Boston would publicly admit it or not, I have heard a number of people through the years describe the Church Center as very tribal in nature. There were, when I was there, a number of different camps, usually centered around different teachers and teachings. Most of this conflict was behind the scenes, but at different times, around different issues, it would come out in more open conflict in the churches. And sometimes these conflicts would even find their way into the newspapers. Around 1900, the progressive philosopher William James wrote an essay on “The Moral Equivalent of War.” In it he proposes organizing in a warlike way to end war. His ideas have had a considerable impact on progressivism ever since. Long before James’ essays, people have taken up various causes, and used very militant speech to rally people to their cause. Mrs. Eddy was no exception, and she uses often bellicose vocabulary to attempt to convey the seriousness of her endeavor. And some of these subgroups have developed a militant stridency about them. I know of CS associations on very different sides of issues that both end with singing “Onward Christian Soldiers” — with the implication that those students will go on and win the battle for the direction of the CS movement, and thus prepare the way for CS to be universally accepted. Try though they have in different ways, the Directors of The Mother Church haven’t been able to put an end to the factions in the CS Church. And they haven’t been able to unify the Christian Science church. Try though they may, it’s evident to a fair-minded observer that officials of The Mother Church will never be able to unify the Christian Science movement, because the writings of Mrs. Eddy are inconsistent within themselves, and certainly inconsistent with the Bible. For instance, one of the biggest dividing lines in the CS church has been on the question of “Mrs. Eddy’s place.” I believed, wholeheartedly, that Mrs. Eddy fulfilled Biblical prophecy, that God appointed her to reveal Christian Science, and that there was ample support in her writings for that position. Conversely, I know many Christian Scientists who believe that the God shown us by Christian Science doesn’t know the human condition at all, and so could not have appointed Mrs. Eddy to a particular role. They come to this conclusion from a study of what Mrs. Eddy says about God. These are two irreconcilable positions — each certain that they are right and that the other is heretical. And yet both are entirely based in her writings. Mrs. Eddy’s narcissism led her to believe that she was specially appointed. Yet in her narcissism she was also aloof from the real needs of people around her, oblivious to the hardships and the real joys of individuals (as opposed to “mankind” in the aggregate). And she conceived of a god in her own image. Those in the camp of CS which I followed were more devoted to Mrs. Eddy the woman and what she said about herself in finding our sense of the CS God, whereas those in the opposing camp were more devoted to the implications of the metaphysical system she established in shaping their view of the CS God. If CS were ever to have any hope of becoming “the one and only system of religion” on earth, it would first have to unify. And in order to do that, it would somehow have to reconcile the numerous (alas) irreconcilable contradictions in Mrs. Eddy’s teachings. Not to mention somehow justifying the countless instances where CS explicitly and implicitly contradicts the Bible, even though it claims to be be divinely based on the Bible. For the Christian Science church ever to triumph, as prophesied by Mrs. Eddy, as the one and only religion on the planet, it would have to get its own house in order first. Several things would need to happen. It would have to somehow square the irreconcilable contradictions in its own teachings. It would have to unify on issues of morality and religion. Harmony and love in their ranks would have to replace backbiting and tribalism. And they would have to have a complete top to bottom culture change. Christian Scientists would have to become fruitful and multiply. They would have to become very active in sharing the message of CS with “the public” and convince us that everything we have ever known about God and reality is wrong. If they don’t, the trends are in place for Christian Science to all but disappear in my lifetime. Can they make all these changes in time to keep from going extinct–let alone move toward becoming the only religion on earth? We will find out soon. Yet while the trends for the Christian Science movement are clear, my focus is not on that movement’s decline. It’s on the advancement of the kingdom of God. And the stage is set for that. Why? Because Christian Scientists want to know a God who really does love them. They want to find real healing in their lives. They want to know the truth. They want to be free of all of the hardships of this fallen world. These are people I dearly love. But they have put their hopes and their trust in lies. God will fulfill His promises and bring His people to His glorious kingdom where there will be no more tears, no pain, sickness, or death. His covenant promises will be fulfilled. His kingdom is coming. Lord, come quickly!